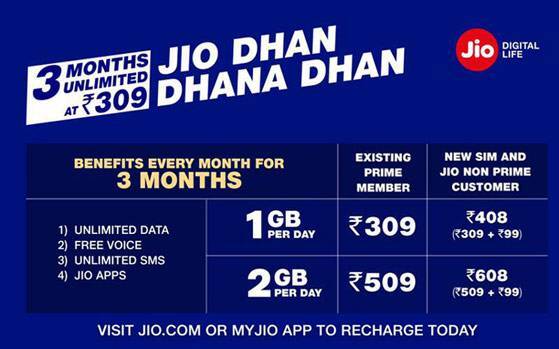 Reliance Jio Dhan Dhana Dhan Offer: The Reliance on Tuesday launched its Jio ‘Dhan Dhana Dhan’ offer, The Reliance Jio users will be able to avail free services – including unlimited data, free SMSs, and Jio apps subscription – for three months. Under the Reliance Jio Dhan Dhana Dhan offer, at Rs. 309 and Rs. 509 recharge packs will provide 1GB and 2GB of 4G data per day, respectively. The 1GB plan costs Rs. 309 for already enrolled JioPrime customers and will offer 1GB data per day along with unlimited calling for 84 days (28*3=84 days). And for the Non-JioPrime members, the same plan costs Rs. 349 and offers same benefits along with the same validity period. Speaking about the 2GB plan, it costs Rs. 509 for JioPrime subscribed users and offers 2GB data per day along with unlimited calling for 84 days. The same plan costs Rs. 549 for Non-JioPrime users and will be valid for 84 days.And for the new users joining Reliance Jio, the company will charge Rs. 408 (Rs. 99+Rs. 309) for the 1GB plan and costs Rs. 608 (Rs. 99+Rs. 509) for the 2GB plan. The Jio.com website and MyJio app show that the actual tariffs for the Rs. 309 and Rs. 509 recharge is Rs. 349 and Rs. 549, but the operator is giving a Rs. 40 discount at present. The Reliance Jio has not announced whether there is the last date to sign up for This Jio Dhan Dhana Dhan offer.